When it mattered, Anderton was the only Labour politician willing to publicly put his career on the line to oppose the Thatcherite dogmas of his colleagues. In the end, even Helen Clark famously professed that she hadn’t come this far to go down in a hail of bullets with Jim Anderton. (The likes of Clark and Michael Cullen professed to be quietly resisting from the inside.Yeah right.) Ultimately in 1989, Anderton’s public hostility to Labour’s decision to break its promise never to sell the Bank of New Zealand caused him to be suspended from the Labour caucus. Ultimately though, it will be Anderton’s principled resistance in the 1980s to the damage being done to this country for which he will be most fondly remembered. So where had Anderton come from? That’s not just a matter of biographical curiosity. There’s a strand of Catholic activism in the Labour tradition (and in the union movement) traceable all the way back to Michael Joseph Savage. Down the years, Catholic radicalism has been a wellspring of the party’s commitment to social justice, and to equal opportunity. Anderton learned about this tradition early, and the hard way. Born James Byrne in 1938, he and his mother Joyce had been quickly abandoned by Jim’s biological father, who was killed a few years later in a railways shunting yard accident. After Joyce remarried, Victor Anderton formally adopted the boy, who took his surname. Music was always a prominent part of his life. As a child in Auckland, Anderton would ride his bike to the NZBC on Sunday mornings to take part in the Uncle Tom’s Children’s Choir broadcasts. Some of his own children shared that gift. His daughter Philippa had perfect pitch, and another daughter Gillian, sang opera. He once spoke of singing four part harmonies with the kids to Mamas and Papas songs while driving along in the family car. One day, he once told me, he’d driven the family to take a fond look at their old home, down by the motorway. Just as they parked up – and to his horror – a bulldozer went straight though the house. In that respect, Anderton’s subsequent re-entry in politics proved to be entirely constructive. Although some in the Alliance might disagree, I think the last phase of Anderton’s political life gave the lie to the 1980s charges that he couldn’t ever work constructively, as part of a team. What had changed? Under the Clark government you could say that Labour had returned to him, back to where Jim Anderton had been all along. Usually, political analysts treat the 1984 election – which ushered in the Lange/Douglas government – as being the crucial turning point in the nation’s recent history. Yet IMO, 1981 was the great ‘what if’ election. National had just been riven with a failed attempted coup against PM Robert Muldoon, and yet incredibly it was at that point – with National on the ropes and the election in sight – that the Labour caucus rebels ( Douglas, Moore, Lange etc) chose to mount their own attempted coup to replace Rowling, and prevent Anderton from succeeding him. Arguably, it was that suicidal action by the Labour rebels ( as much as the 1981 Springbok tour) that narrowly cost Labour an election that it should have won. If it had, Rogernomics would never have happened, Anderton would have succeeded Rowling, and New Zealand would have conducted a far less socially and economically damaging process of economic reform. Crucially, New Zealand would also still own most of its key economic infrastructure. By 1984, Muldoon’s defeat had become inevitable. 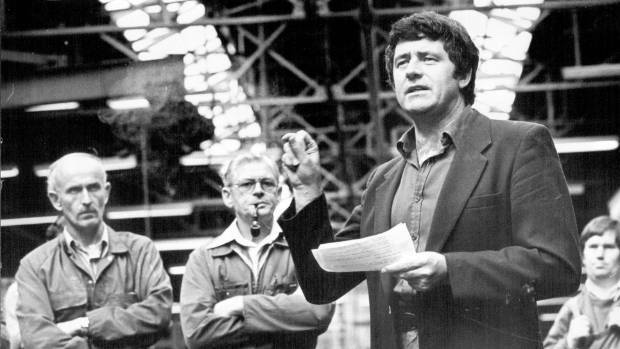 In 1981, his defeat would have been a genuine victory for working class New Zealanders. For that reason, you have to wonder whether the Rogernomes consciously chose the path of sabotage in 1981, rather than face a Rowling triumph, and the eventual prospect of Anderton as Prime Minister. We’ll never know for sure. Jim Anderton will have to remain as the best Prime Minister this country never had. As I’ve indicated, he had failings aplenty in all realms of his life, and given the chance would confess to most of them. Anderton could be imperious and incredibly stubborn. Later in life especially, he could also at times seem to be needy for attention and for acclaim; a forgiveable trait, after all of his years in the political wilderness. More than anything though…it was the energy and commitment he brought to his life, and to his career, that made him so incredibly inspiring. For those who came within his orbit, he will always be an unforgettable figure. Footnote : As a young man, Anderton had also been an exceptionally talented cricketer. At one stage of his career while batting for Wanganui, this had brought him up against Gary Bartlett, one of the fastest bowlers this country has ever produced. Anderton took a number of body blows during his time at the crease – and not because of any stoicism on his part, he said, laughing incredulously, but because he couldn’t see the ball once it left Bartlett’s hand. Given the above, this seems like an appropriate track to play this Monday, in memory of Jim.